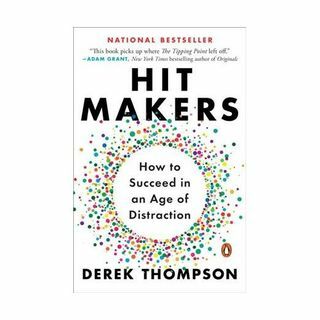 As "Atlantic" Senior Editor DEREK THOMPSON writes in HIT MAKERS: How to Succeed in an Age of Distraction - if you think a mega-hit movie, song, or app came out of nowhere to become a word-of-mouth success in today’s crowded media environment, you’re missing the real story. Applying cutting edge science to stories of hits across the decades, including recent sensations, Thompson reveals how each blockbuster actually has a secret history - of power, influence, dark ... Maggiori informazioni broadcasters, and passionate cults that turn some new products into cultural phenomena. From the dawn of impressionist art to the future of Facebook, from small Etsy designers to the origin of Star Wars, HIT MAKERS is a captivating tour through the last century of pop culture and the most valuable currency of the twenty-first century—people’s attention. Original, fascinating, and deeply entertaining, HIT MAKERS uncovers the hidden psychology of why we like what we like and reveals the economics of cultural markets that invisibly shape our lives. Shattering the sentimental myths of hit-making that dominate pop culture and business, Thompson shows quality is insufficient for success and nobody has “good taste.” Some of the most popular products in history were one bad break away from utter failure. The consumers that matter the most aren’t the early adopters but rather their friends, followers, and imitators. It may be a new world but there are some enduring truths to what audiences and consumers want. People love a familiar surprise: a product that is bold yet sneakily recognizable.